Twitter for Windows 10 update brings Group DMs, Multiple Accounts, and more. 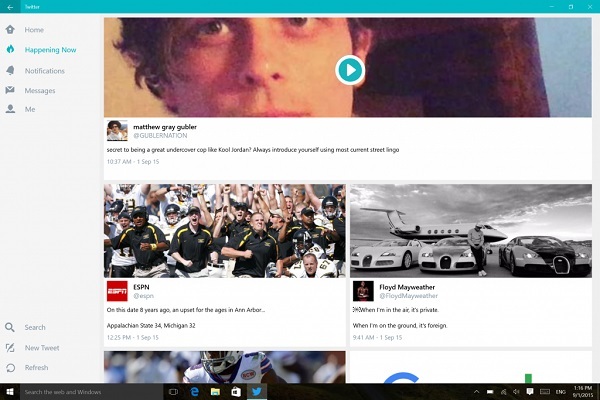 Twitter for Windows 10 got an update bringing you some fresh new features. Now you can add and quickly switch between multiple Twitter accounts right from within the app, have a private conversation with a group of your favorite people using Groups for Direct Messages, comment on other people's Tweets with the Quote Tweet feature and view and subscribe to lists. You can also rest-assured, your unsent Tweets are now saved to a Drafts folder for later use. + Groups for Direct Messages: Have a private conversation with a group of your favorite people. + Now add your own comments to other people's Tweets. + View and subscribe to lists, you can find them on the profiles page. + Unsent Tweets will now be saved to drafts!